Eden Hazard scored a second-half winner as Chelsea earned a deserved 1-0 away win over Bournemouth to move back within nine points of Premier League leaders Manchester City. In the build-up to the game, manager Antonio Conte lashed out at “b******t” reports which claimed the players were unhappy with his training methods and linked Carlo Ancelotti to his job. And there was further pressure on Chelsea after wins for City, Manchester United, Arsenal and Liverpool earlier on Saturday, but the champions responded with an assured display. The visitors dominated the first half but could not find a breakthrough as Alvaro Morata missed a golden chance before having a goal controversially ruled out for offside. 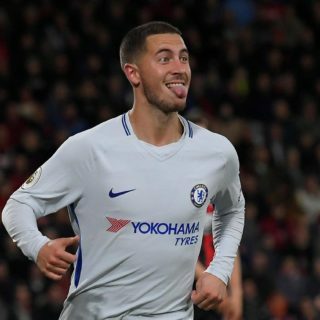 However, Hazard did strike early in the second half, firing in his fifth Premier League goal in four matches against Bournemouth by beating Asmir Begovic at his near post. Chelsea, who rallied to beat Watford with a thrilling late comeback last week, have now won two straight top-flight games after only tasting victory in one of their previous four. The win means the Blues move back up to fourth in the Premier League, four points behind United in second and one adrift of third-placed Tottenham, who lost at Old Trafford. Bournemouth had beaten Stoke City in their last league outing, but this defeat – in which they failed to produce a shot on target until second-half stoppage time – leaves Eddie Howe’s side 19th in the table with only seven points and six goals to show from their first 10 games. Pedro, a scorer against Watford, fired over from just outside the area early on. At the other end, Benik Afobe over-hit a pass for Charlie Daniels to end a promising Bournemouth attack, although it was the visitors who wasted the best chance of the first half. A poor clearance from former Chelsea goalkeeper Begovic allowed Hazard to slip Morata through on goal, but the striker could only put his tame finish wide. Morata had the ball in net a few moments later, only to be denied when – in what looked like a marginal call – it was ruled Cesar Azpilicueta had strayed offside as David Luiz’s original deflected shot was fired at the Bournemouth keeper.